Our collection service takes everything working and non-working.This includes servers, PC’s, laptops, LCD screens, printers, switches, modems, cables, tablets, and phones. If you are a business, corporation or government institution with surplus or redundant old I.T. equipment we collect computers and IT equipment from all over Melbourne. This collection service may be free depending on volume and the nature of your redundant equipment and waste requirements. We can also provide you with a certificate ensuring secure data destruction and ethical quality assured environmental recycling. For household and small business we are happy to receive your unwanted technical devices and IT equipment. This includes servers, PC’s, laptops, LCD screens, switches, modems, cables, tablets, and phones. 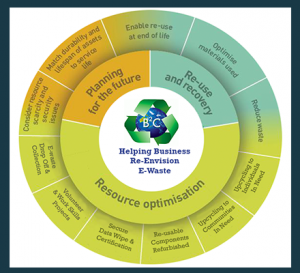 B2C use the services of an ISO & AS/NZS endorsed company for the recycling of our e-waste. We can therefore ensure any of the e-waste resulting from the equipment you donate will be recycled in a secure ethical, environmentally and cost effective way.